Despite being one of the most widely played sports in the world, bowling can be quite the challenge for the majority of bowlers. Let’s face it; we likely have ALL been that person who shows up to a bowling outing with friends and bowls the lowest score in the group. If this happens to you a little more often that you would like, I have compiled 5 tips and techniques I have found helpful to bowl a higher bowling score. The bowling approach is key. In fact, your approach and bowling swing are the two MOST important skills that you need to work on to improve your overall bowling skills and raise your bowling average. For the novices amongst us, what is the approach anyway? Well, approaching the bowling lane means to position yourself between the preparation floor and the platform, or ideally to find the perfect position and spot which will determine your walk towards throwing the ball. The visual below helps demonstrate the proper technique on the approach. If you are able to build a solid approach and a respectable bowling swing, you WILL become the type of bowler that your friends will envy and for which you will see significant improvements to your bowling score. While you might not become a PBA tournament champion with a better approach, you’ll definitely be able to hold your own amongst your friends – and after all, that is what social bowling is all about! How one holds the ball is almost always proportional to his or her score. For a chance at that elusive 300 (or for most of us, that elusive 100 to 200 score), it is important to hold the bowling ball in the correct position. In fact, this position can determine the entire course of the game. When holding the ball, examine the hole position and angle of the bowling ball as it leaves the hand. One key to holding the ball is to use slightly more gripping pressure on the finger pads of the hand than on the thumb pad, while maintaining consistent gripping pressure throughout the entire swing cycle. As new bowlers develop into better bowlers, the thumb should be released a split second before the fingers so that the fingers may impart the rotational action which causes the bowling ball to travel down the lane with an effective rolling and hooking motion. 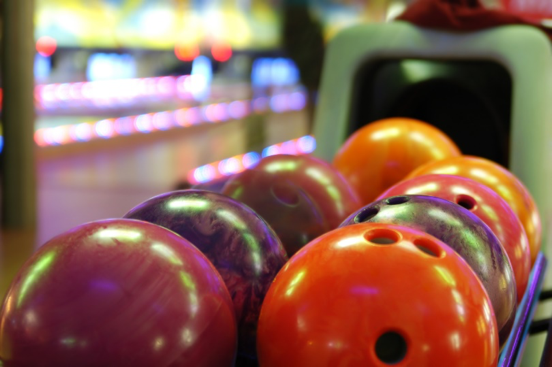 Like most sports, or frankly most aspects of life, it takes practice to improve, but once you see your bowling score reach new heights, you will enjoy the game of bowling all that much more. How one releases the bowling ball plays as much of a role as any in achieving a higher bowling score. Proper gripping is key when it comes to releasing the ball consistently. When you release the ball, geometry comes into play, and although many people have a love/hate relationship with geometry, it is worth considering, even if only for a minute or two as you read this article. Releasing the ball ultimately requires understanding the axis rotation. Ideally, your ball will spin smoothly and incorporate both the two axis of rotation – vertical and horizontal. If you can watch an accomplished bowler, whether on tv or at the center, you will notice this smooth axis rotation and how they use while considering the angle of motion – helping you identify the end goal of becoming a more polished bowler! Without question, where one aims plays an important tactic in learning to bowl well. The more accurately you aim, the more pins you knock down; and that’s the ultimate goal, which in the end gives you the better score overall. Most novice bowlers believe that staring at the pins will be most beneficial to knocking them down. However, this really isn’t the case. 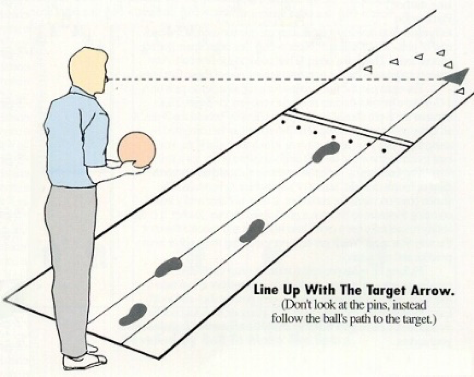 Experienced bowlers look for reference points on the lane itself, such as the arrows on the bowling floor, to allow for a more accurate aim. But which arrow is the right one to target? Unfortunately, this question does not have a simple answer as it truly depends on a variety of factors ranging from your own bowling style to the lane condition itself. If you throw a relatively straight ball, however, you should aim for the center arrow, which corresponds to the head pin. Once you understand the concept of aiming for the reference point that best suits, you too can develop near-perfect aim with practice, which will boost your bowling score. The bowling center you choose can be critical to your development. Ultimately, you will only improve as a bowler if you take the time to practice. And you will only practice if you enjoy the bowling center that you consider your home alley. It will be a lot easier to make the time to practice if your bowling center suits YOU as an individual. So choose the bowling center that best suits your needs, whether location, comfort, ambience, food, or drinks are your hot button. The venue itself truly is important; after all, if you don’t show up, you simply won’t see skill development growth and bowling score improvement. At the end of the day, bowling for the vast majority of the population, is simply about having fun. But at the same time, it becomes a lot more fun as one’s bowling score improves! Below I share links to a few additional bowling articles, as well as a link to my favorite bowling venue to practice – The Pin Deck. 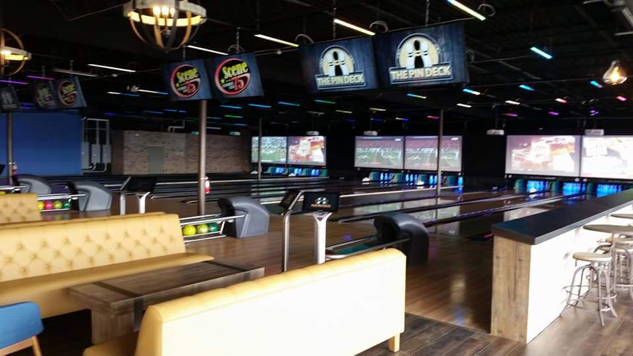 If you have yet to visit The Pin Deck next to Scene75 Entertainment in Cincinnati, I suggest you give that venue a try. It is by far the nicest bowling alley I have ever visited – and it is great for both practice and social gatherings with friends.